UNDP Zambia country Representative Janet Rogan has turned down an appointment by the opposition UPND president Hakainde Hichilema. 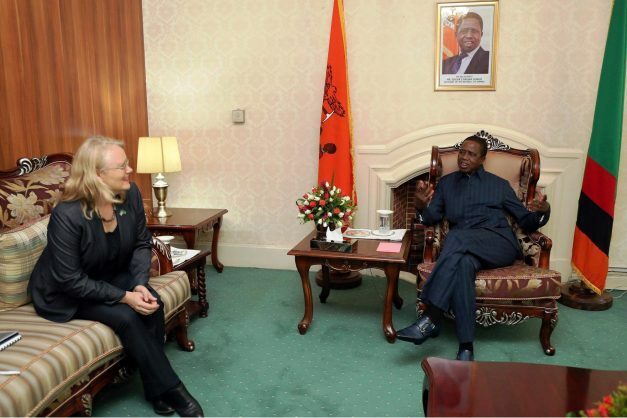 Hichilema who has accused Ms Rogan of having been involved in the rigging of the 2016 elections for Edgar Lungu and PF wanted an audience with the UNDP Boss on Wednesday. But Ms Rogan who last week had a meeting with President Lungu said she was not available to meet Hichilema and did not indicate or give an other alternative date. Her office stated so in a letter to Patrick Mucheleka, the UPND Deputy Secretary General. In reaction, the UPND said they now have no other option but to go all the way and report Ms Rogan at the New York office. The opposition UPND has refused to recognise President Lungu as winner of the 2016 elections saying the poll was manipulated. 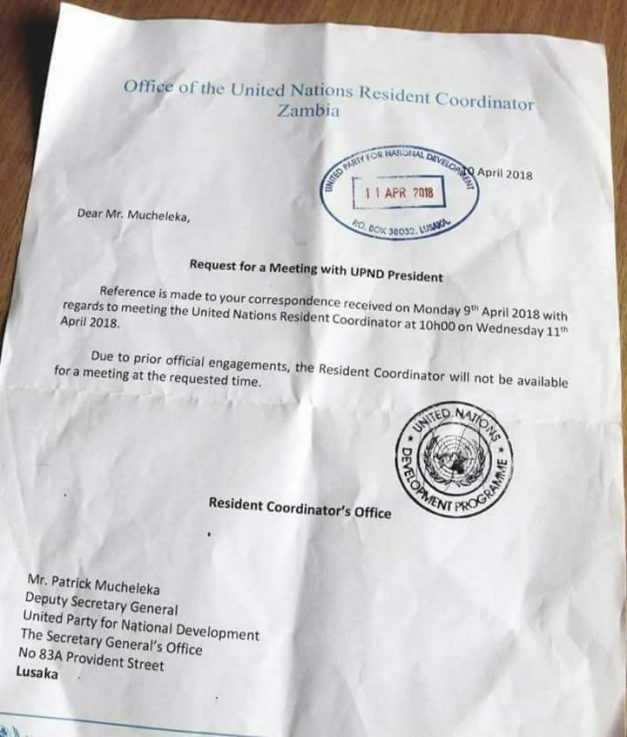 If above copy of letter is genuine, and I mean if, then refusal by UNDP Zambia country Representative Janet Rogan to meet HH-UPND in this manner, i.e. without suggesting an alternative date or indicating whether or not she is willing to consider and alternative date, truly raises suspicion and questions from any well-meaning person. What’s going on? Is this conflict resolution? We all know there is a genuine and well-documented conflict between PF and UPND albeit non-violent, so isn’t UN supposed to be the master in conflict resolution whenever a situation presents itself and thereby prevent a volatile situation from getting worse? Seriously, is she acting in good faith by refusing in this manner? Is this in accordance with UN protocol or what? Why would she meet with UNPD after they accuse her of involvement in rigging of the election? You can’t have it both ways. UPND should have reserved, or at least declared judgment, until after meeting her and hearing her out. Premature and stupid and with consequences. If you truly meant well in your comment, then please note you have missed the plot completely. When you represent a dignified organisation like UN in a particular Country, you put your personal ego and feelings aside when a local politician admonishes you. Instead you act, talk and react IN ACCORDANCE with UN procedure in such a situation. If you cannot take the heat, then get out of the kitchen. So, the question is:- Is UNDP Zambia country Representative Janet Rogan reacting in the best interest of UN conflict resolution strategy or not? If you did not mean well in your comment and want to put ego first, then please accept my apologies and carry on arguing from ignorance. This woman is an idiot. Not fit to work for the UN. IN the Central African Republic, the same UN is talking to both sides. But the UPND have to mind their language.Janet Rogan’s home country is the UK, a member of the permanent 5 of the UN Security Council. That alone means something and it is that the UK agrees with what she is doing. The UK was there at creation of the League of Nations, when that failed the UK was there at creation of the UN. The permanent 5 are the UN.